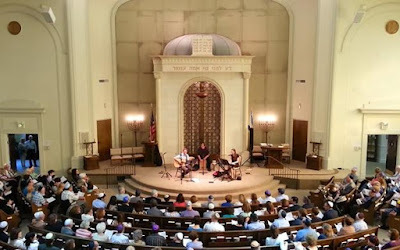 Sunmoon Pie is an Atlanta-based Jewish music group, known for alternative Jewish prayer melodies & meditative Hebrew kirtan-inspired chants. Consisting of singer-songwriters Bonnie Levine on keyboards/harmonium & Michael Levine on guitar, the duo is often accompanied by talented percussionists and other musicians. In this video, they sing Shalom Aleichem, the traditional song to welcome Shabbat, at Congregation Beth El in Birmingham, Alabama.